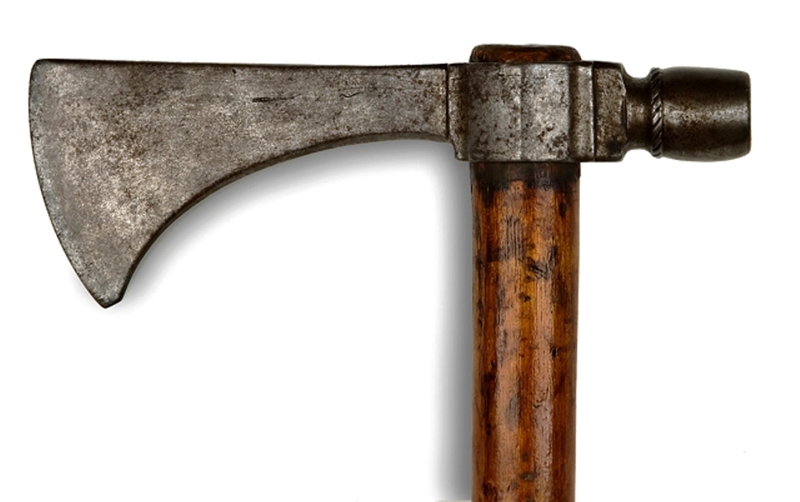 Pipe tomahawks are probably the most coveted of the trade tomahawks and usually the most expensive. 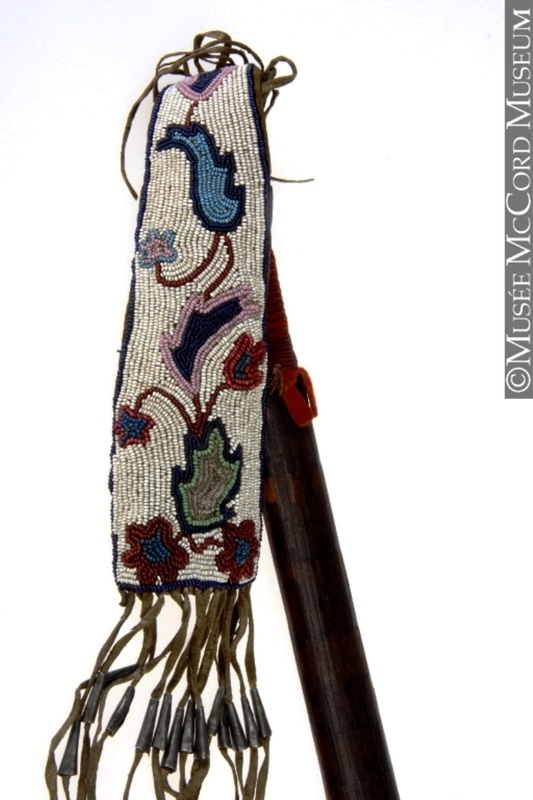 The same was true during the fur trade era however many of these were presented as presents to the chiefs of tribes to encourage their loyalty, some with elaborate and expensive inlays and craftsmanship. 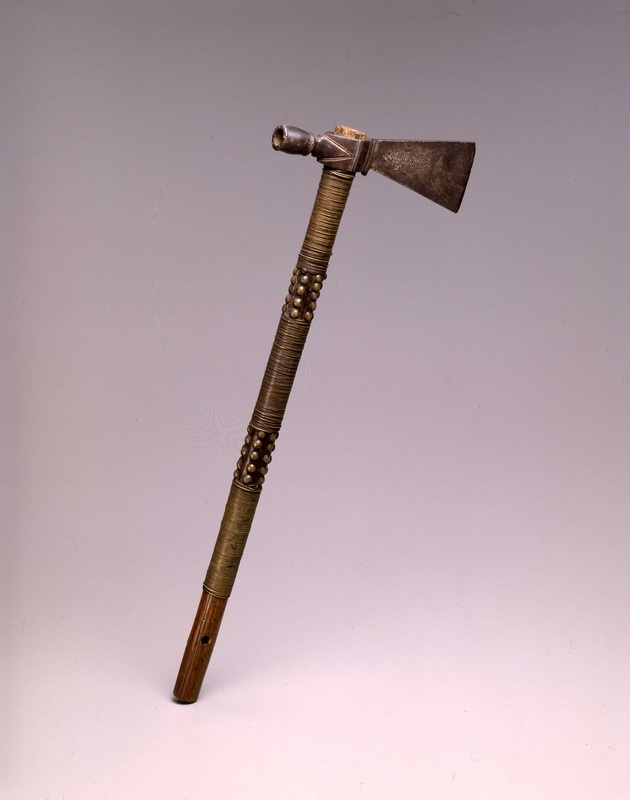 They were multipurpose tools in the sense they could be used in war and for smoking rather than carrying both items separately and the earliest ones known are from the late 1740's. During the French & Indian War (1754-1761) they began to be made in large numbers to tribes allied with Britain and France. But they were also very symbolic in that they could be used both for war and for peace. Many were made in Sheffield, England, France & in North America. 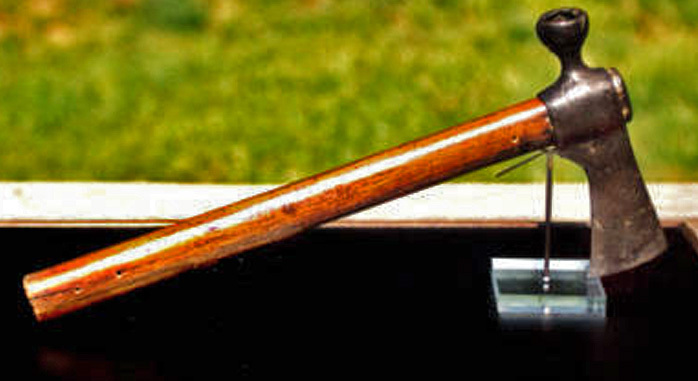 Although any wood could be used they often used ash, Osage Orange for it's resistance to decay, or curly maple when the KY/PA rifle makers made them. Ash was particularly popular because the saplings pithy core could be easily burned out with a red hot poker for a smoke hole. 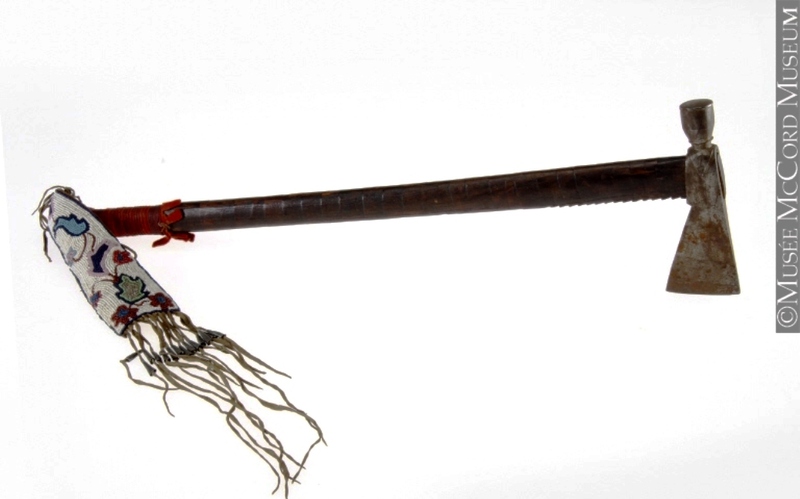 Some late examples were not meant to be used as weapons but rather as a ceremonial smoking item. Few whites comprehended the importance of that sacred holy act to them. I've noticed some authors have attempted to connect a particular style to a tribe based on previously known ones. It hardly ever works that way & there is no evidence to support that conclusion. 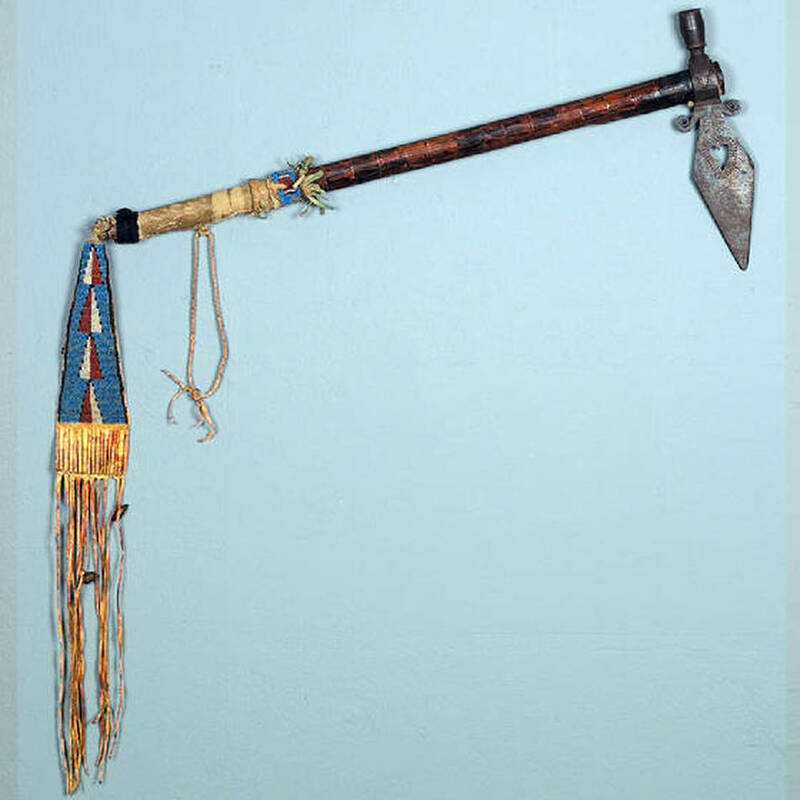 When Indians were presented pipe tomahawks such as in Washington DC there often was an assortment of tribes represented & an assortment of pipe tomahawks presented to them. There was no significant standardization of style for each tribe that would support conclusions. Styles did seem to follow trends that help us determine the time period of manufacture although some of those conclusions are not as consistent as we might prefer. With very limited information available on a specific tomahawk style there are bound to be faulty assumptions made. All that can be done is to utilize our best information & be willing to alter it if its found to be in error. Hand Forged pipe tomahawk with engraved image of an Indian man on the face of the blade. Handle has brass tacks and brass wire wrapped around it. Circa 1850's. Circa 1860 Shoshone, classic western form.--photo courtesy NMAI SMITHSONIAN. 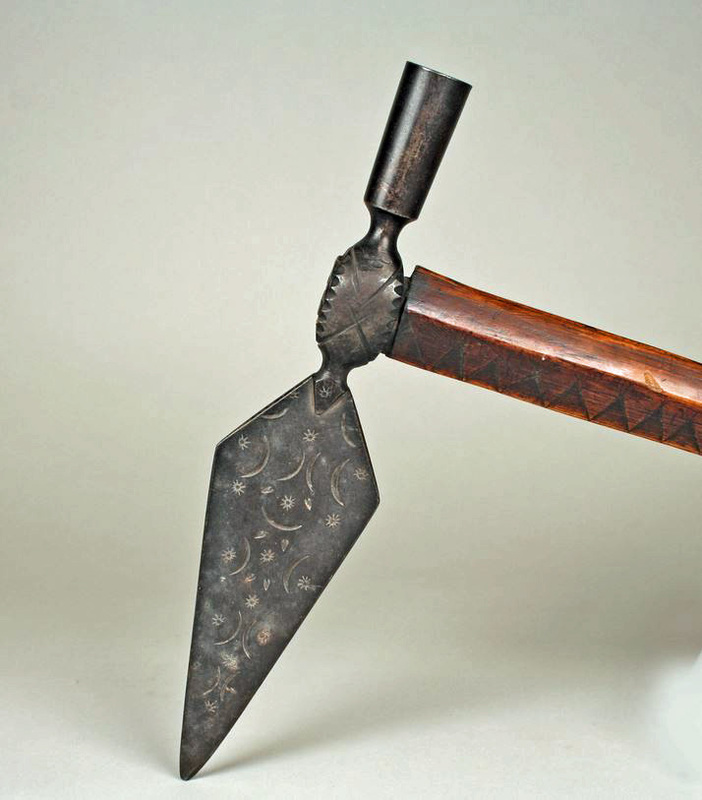 This style of spontoon pipe tomahawk with the diamond shaped blade without spurs/projections, decorated blade & long tapered cylindrical bowl is indicative of what early writers/collectors in 1904 termed 'Minnewaukan' from the ca. 1880's period and found from the Rocky Mountains to Wisconsin & thought to be made by a single blacksmith. Because of the name some early writers assumed it had some association with Milwaukee, WI. as some were found in that area. However my research indicates this style originated from a blacksmith or blacksmiths at the reservation at Devil's Lake (Minnewaukan Lake), North Dakota. 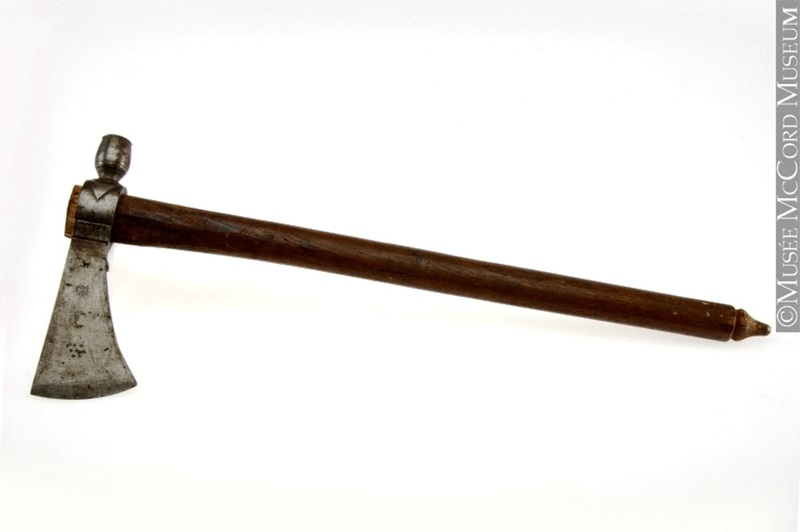 Whether it was an Indian blacksmith there or one of the U.S. agency blacksmiths is uncertain. There was at least one blacksmith shop running there continuously beginning in 1871 with John McLaughlin appointed as it's first blacksmith. Often assistant blacksmiths were rez Indians learning the trade. 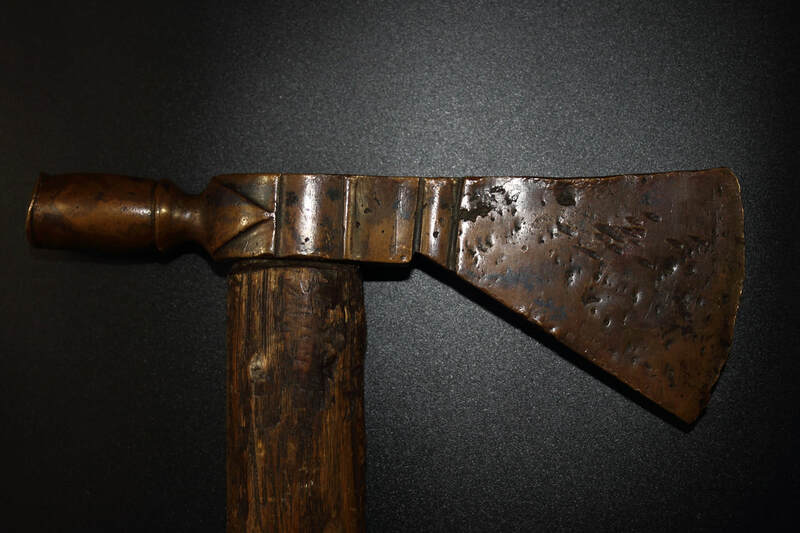 Very similarly decorated with crenulated edged eyes & elongated cylindrical eyes however with this type has a ordinary fan shaped blade with the same punch marks --not a spontoon-- were 'found' in Western Wisconsin. Tribes frequently traded with each other so in this way they likely spread throughout the region. 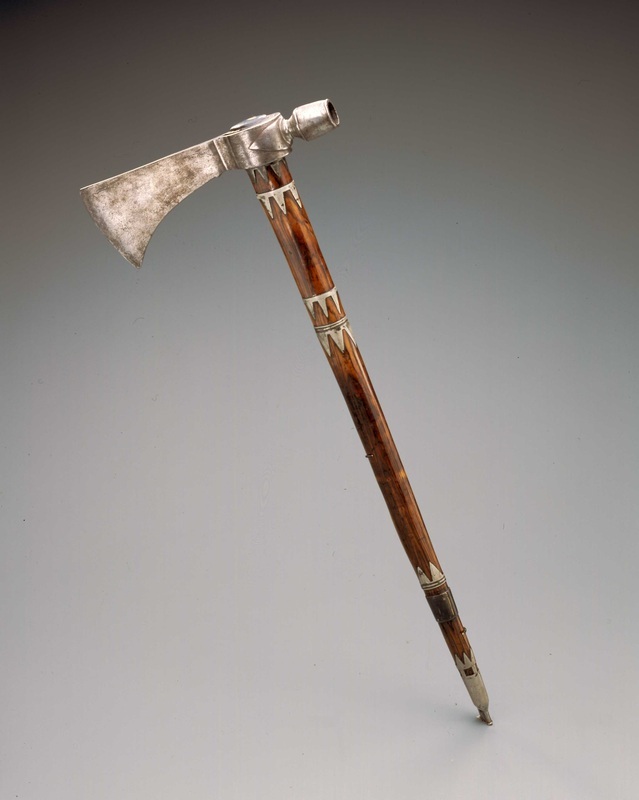 Its worth noting that records of Western tomahawks having been thrown is completely lacking from my research however there are numerous records of the Eastern tribes throwing their smaller, shorter tomahawks. This may have been due to Western tribes fighting more often on horseback needing the longer reach as evidenced by their pictographs. Due to their later migration, Eastern tomahawks were for the most part from the mid 1740s- 1850 period & Western ones tended to be 1830's-1890's. 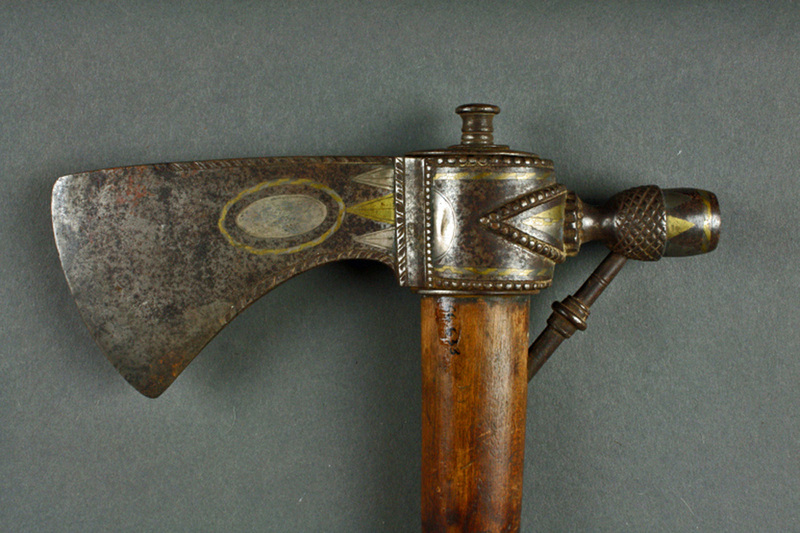 "The warlike arms used by the Cherokees are guns, bows and arrows, darts, scalp-ping-knives, and tommyhawkes, which are hatchets; the hammer part of which being made hollow, and a small hole running from thence along the shank, terminated by a small brass tube for the mouth, makes a compleate pipe. 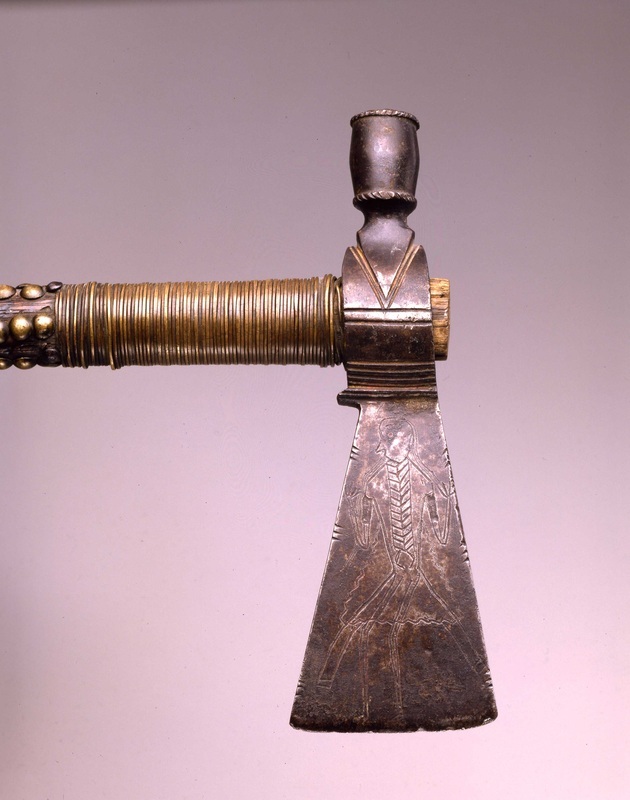 There are various ways of making these, according to the country or fancy of the purchaser, being all made by the Europeans, some have a long spear at top, and some different conveniencies on each side. 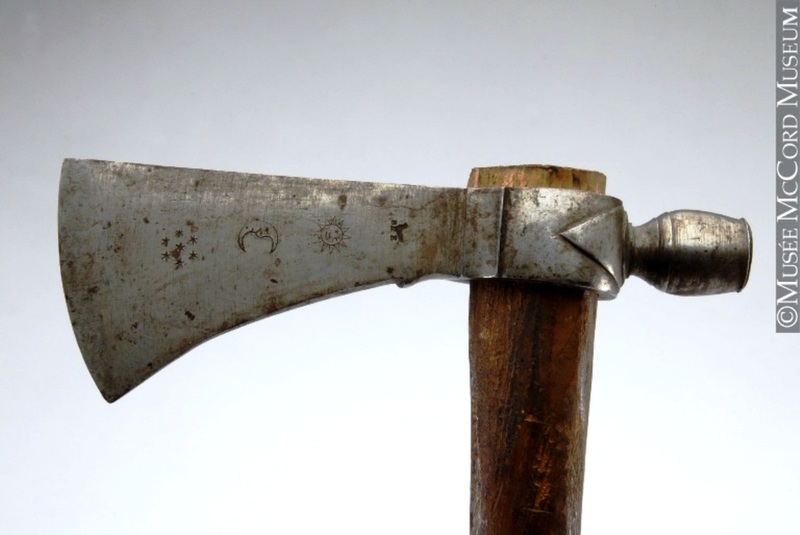 This is one of their most useful pieces of field-furniture, serving all the offices of hatchet, pipe, and swords; neither are the Indians less expert at throwing it than using it near, but it will kill at a considerable distance." Source: The Memoirs of Lt. Henry Timberlake, The story of a Soldier, Adventurer, and Emissary to the Cherokees, 1756-1765 edited by Duane H. King, pg 27. Images courtesy of the McCord Museum of Canadian History in Montreal, Quebec. 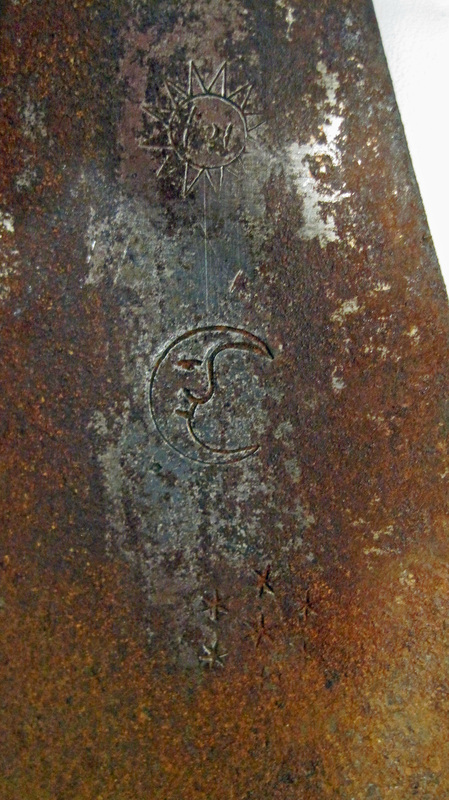 I have seen another example of this tomahawk with the same half moon, stars, bird and initials "B E" marking highly polished and also another one in Indian Tomahawks & Frontiersmen Belt Axes by Hartzler & Knowles, pg 131. These have been found in the Great Lakes area-- in particular an example without nickel plating was recently dug up by Kevin Hughey in St. Ignace, Mi. area. 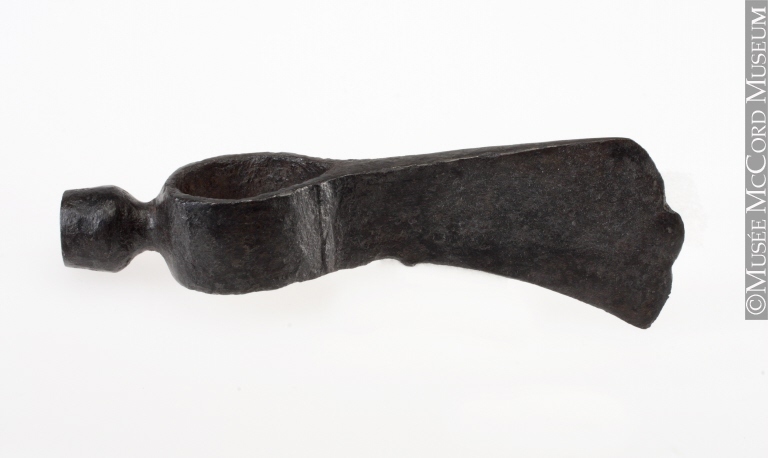 Another example of this PT with the tulip shaped bowl was presented to the Shawnee Chief Tecumseh from British Commander Col. Henry Proctor in 1812 for his alliance in that war. Images courtesy of the McCord Museum of Canadian History of Montreal, Quebec. EARLY 19TH C.
Image courtesy of the McCord Museum of Canadian History of Montreal, Quebec. 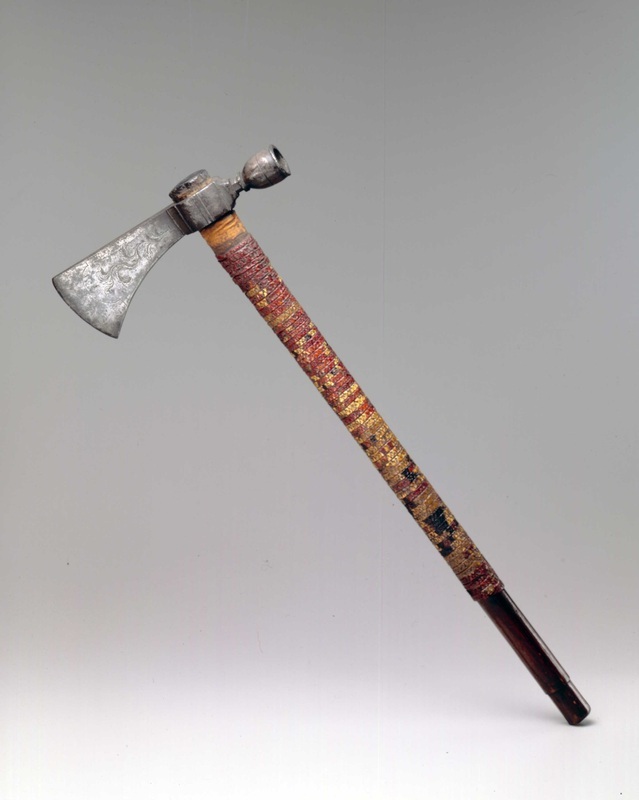 Image courtesy of the McCord Museum of Canadian History in Montreal, Quebec.--2ND HALF 19TH c.
This pipe tomahawk displayed in the Indiana State Museum is attributed to the gunsmith Squire Boone (brother of Daniel Boone). It is rather plain without decoration or name axcept for a rope-like decoration around the bowl. It measures 7" x 16.25" overall. Circa 1780. Notice the raised pedestal supporting the bowl typical of pre-1800 PTs. 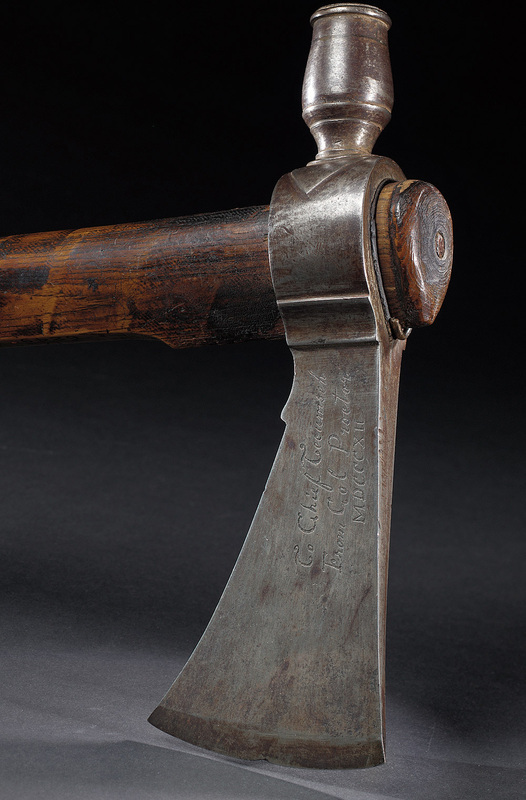 This pipe tomahawk with a bowie knife brass inlay is distinctive of the gunsmith & blacksmith John Small who made tomahawks in Vincennes, Indiana 1790-1820. 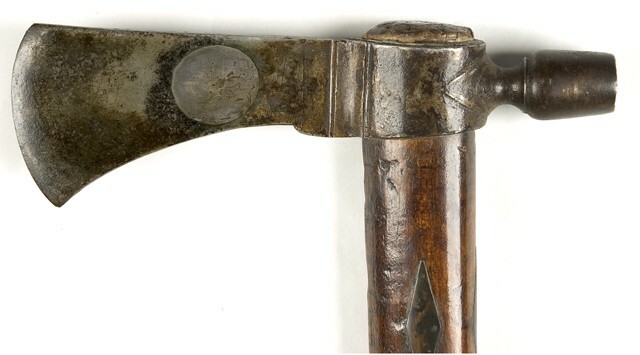 Diamond shaped silver inlays on handle. 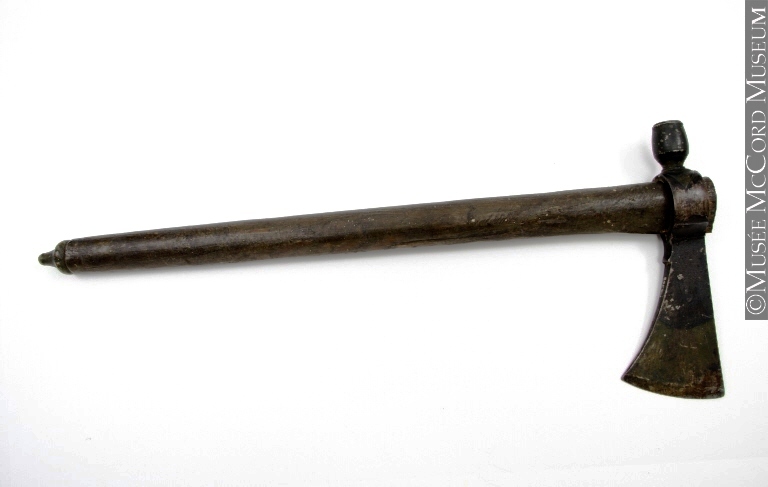 Circa 1790-1800 excavated Eastern pipe tomahawk courtesy of Brian Rollason collection & photos. Probably North American made by a local smith. Source: Black Hawk, An Autobiography by Black Hawk (Sauk Chief). This outstanding example is decorated with gold & silver inlays, engravings and wood carvings. Obviously it was to commemorate an alliance or friendship of some kind. Truly art. Ca. 1800?